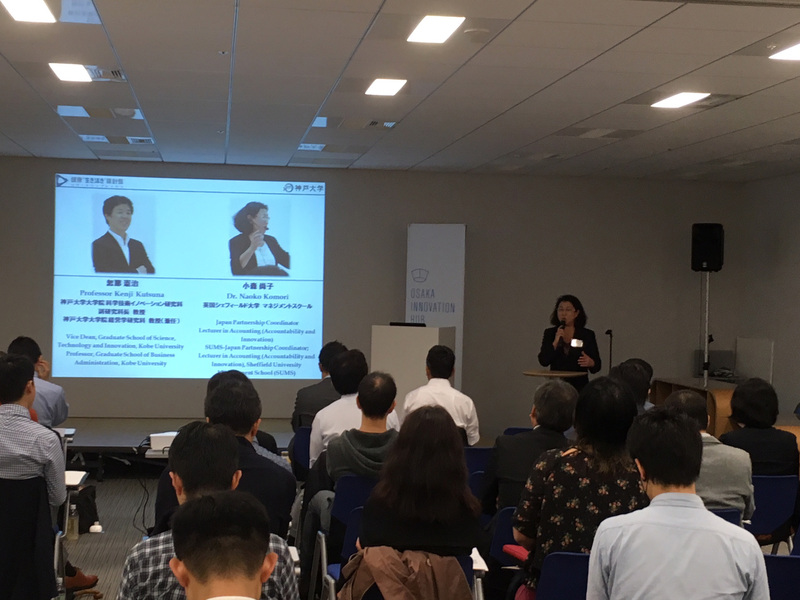 A recent conference held jointly between the Management School and Kobe University, held at Osaka Innovation Hub, investigated science and technology innovation and entrepreneurship. Alongside Kobe’s Vice Dean for the Graduate School of Science, Technology and Innovation Prof Kenji Kutsuna, Dr Naoko Komori, lecturer in accounting at Sheffield, organised and delivered the successful event which was funded by the Compass to Healthy Life Research Complex Programme. Dr Komori invited a number of renowned scholars and practitioners to speak at the conference which considered ‘the message from Japan’ in the context of science/technology corporations seeking to improve their competitiveness by fostering entrepreneurship. About 100 attendees, including academics and business representatives, enjoyed the lively programme which welcomed three keynote speakers. Prof Kentaro Nobeoka, Dean of the Institute of Innovation Research (Hitotsubashi Uni) and author of ‘Thinking Beyond Lean’ led the programme, followed by Prof Dimo Dimov (University of Bath) and AJ Van Bochoven (Head of Strategic Innovation, ‎Cambridge Consultants). They discussed innovation strategies between Japanese and European/UK corporations. Following the formal programme, a popular networking event was held at the World Beer Museum. Dr Komori said: “This is a landmark conference that introduces studies on Japan that are largely missing in the field of innovation and entrepreneurship. The kick-off event, held on 21 October, has enabled us to develop a strong research team in the UK that will start to develop research on translating cultural knowledge on Japan in an international arena”. This is the Management School’s second collaborative event with Kobe. Click here to read about prior activities. This entry was posted on Tuesday, October 31st, 2017 at 13:01	and is filed under Conference, Entrepreneur, International, Research. You can follow any responses to this entry through the RSS 2.0 feed. Both comments and pings are currently closed.